5 Bedroom Home with an open floor plan. 4 bedrooms upstairs. Kitchen has Granite, Stainless Steel, Walk in Pantry, 10' ceilings. Family room on lower walkout level. Woodland Cove Association offers large pool and clubhouse, trails and more. 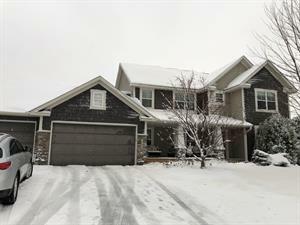 Beautifully maintained 3 bedroom 2.5 bathroom, 1,560 sq ft townhome. Enjoy one level living, a terrific outdoor deck, quiet and private, plus the benefits of a HOA providing lawn care and snow removal. Available 2/24/17 - Gorgeous Home W/High End Upgrades! Gourmet Kitchen W/Wolf Appliances, Alder Cabinets & Hickory Hardwood Floors. Updated Mechanicals, Roof & Windows. Beautiful Family Room W/New Carpet & Tile, Refaced Fireplace & Door To Patio. Man Cave Has A Wet Bar & Workshop Area. Over Sized Two Stall Garage. Excellent Neighborhood - Must See!! 3 bedroom upstairs, plus den/office. Beautiful upgrades, open concept kitchen to living room. Great location nearby shopping and restaurants. Fenced yard, Deck. Walk to the Dakota Trail. Just minutes from both downtown MPLS and Ridgedale mall, this superb home lies nestled in a quiet neighborhood near 394 & Highway 73. You'll enjoy the picturesque backyard view while entertaining from the lower level walkout (with wetbar)!. With a roomy 5000 sq. ft of finished living space and oversized bedrooms, you'll experience the outdoor beauty with a Great room w/wall of windows.Kitchen offers walk-in pantry & work station.